You’re probably wondering how you could possibly identify problems with your roof by yourself and what you should do if you do find them. Unless you’re a trained professional, it’s unlikely that you’ll be able to identify all the problems with a roof. However, there are some common problems that you can easily spot. Leaks – If you spot watermarks on the ceiling, that’s a definitive indicator of a leak. The problem is water stains on the ceiling won’t definitively indicate where the leak is – oftentimes, the leak originates elsewhere. This is especially true when you’re dealing with a sloped roof. It is possible that the leak could be a little higher on the roof than the location of the watermark, so you’ll need to call a professional in to locate the leak and patch it up. Gutter blockage – Blockages in the gutter can cause rainwater to spill over the gutter apron. This could result in damage to the beams. Cleaning the gutters on a regular basis will prevent blockages from forming. When cleaning the gutters, make sure that the ladder is secured. Do not attempt to clear gutters if you think that you’ll be risking your safety. It would be best to call a professional instead. Pooling water – This is common among low- and flat-sloped roofs. If you do notice a pool of water, it can only mean that the area’s underlying structure has softened. If this is the case, you will need a professional to inspect the area and make the necessary repairs. Loose or missing shingles – It’s not advisable to climb onto the roof to check on your shingles, but if you do happen to spot areas where the shingles are loose or missing, then you’ll need to have repairs done as soon as possible. Repairing shingles will require some expertise, so it would be best to contact a professional roofer for the job. 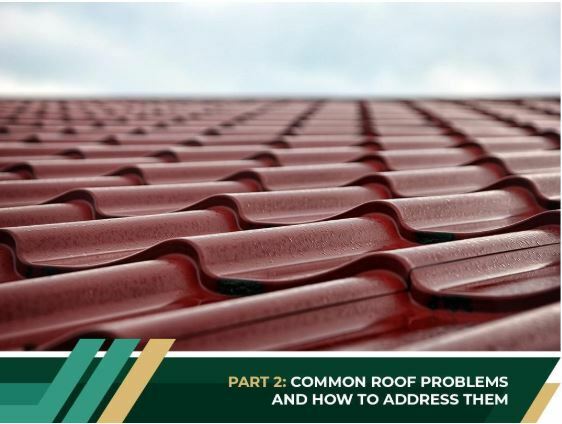 In the Part 3 of this series, we’ll discuss the most common causes of roof problems so you can address them and prevent future problems from occurring.